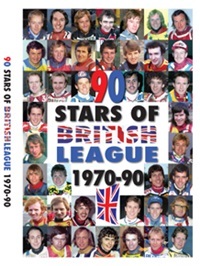 90 Stars of the British League is a new double-DVD from Retro Speedway that picks out the greatest riders in the British League from 1970 to 1990 and showcases their talents. The selection of races is varied and interesting, coming from league matches, golden helmet races, test matches and various individual meetings. For some riders we see one of their races, for others there are three or four shown. It's not always a case of watching the featured rider smoking the opposition, for example Bobby Beaton's race shows him battling to a fine second place. Those that saw Bobby will probably agree that we remember him best for those kind of races, rather than as someone who'd lead from tapes to flag. The first disk starts with Jan Andersson and takes us through to Lance King, while the second one starts with Richard Knight and ends with Doug Wyer. All the biggest stars of the era are included, from World Champions like Mauger, Olsen, Michanek etc alongside consistent league performers like Gordon Kennett, John Davis and Mitch Shirra. Four of the Collins brothers are also represented, a reminder of their remarkable impact on the sport. There are also more unsung heroes like Ian Cartwright, Barry Thomas, John Jorgensen and Mark Courtney included in the 90. The selection of the 90 "biggest" stars is obviously subjective, but there are no obvious omissions from the list. You can see the complete list of riders on the Retro Speedway website. As well as seeing the riders, we can also enjoy watching from lost tracks such as Cradley Heath, Hull and Halifax, a sad reminder of how many great venues have disappeared over the years. These DVDs are virtually guaranteed to provide you with a couple of enjoyable evenings as we build up to the new season. The great Dave Lanning sums it up best in one featured line of commentary - "First Class Speedway".